Riley has discovered a wombat in his nanny’s garden. But why is this furry creature so grumpy? Join Riley and his friends from books one, two and three, as they zoom around the stunning sights of Melbourne in search of a wombat that simply needs a place to call home. 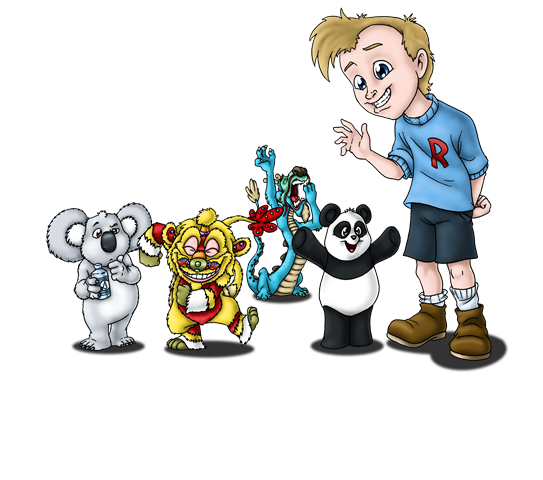 Riley and the Grumpy Wombat has black and white photos along with illustrations, and takes the characters on a fun adventure around Melbourne, Victoria. And now, over to Tania McCartney! It seems the writing processes of authors are as varied as there are books … and perhaps this is why it’s so fascinating to learn how authors go about penning their work. I’ve been writing since my teens, yet each style of book I write goes through an almost entirely different process—and this process has actually changed over the years as I’ve found better ways of working. I remember writing my first adult novels in my late teens and early twenties—the process I used then was … well, there wasn’t really a process. It was just ramblings. There was no plot structure, no character development, no deliberately-placed threads that were then woven delicately through the text, no no. It was just open slather. I wrote from the heart, I wrote with passion—I just wrote. That was some of the easiest writing I’ve ever done. I sent one of these novels—Breathing Under Water—in for The Australian/Vogel Award (this was around 20 years ago) and although it wasn’t shortlisted, the publisher liked it enough to send it to an outside reader. After a few months, I received the outsider’s critique, which basically said there was ‘obvious talent’ but did the publisher really want to spend time working with me to hone a messy storyline. The publisher didn’t. I was so crushed, I didn’t submit anything to a publisher again for close to ten years. But it wasn’t only because I was crushed—it was because I had no idea how to hone and structure my work. Since that time I had plenty of ideas but was simply too confounded about the process. I thought about reworking Breathing Under Water, and I played with it occasionally, but nothing eventuated. Then, in 2007, I began work on a fresh idea for a young adult novel that struck me so quickly, it poured with ferocity from my fingertips. The plot of this new book—let’s call it The One—required a lot of research, intense character placement and development, and a mass of location and time links. I needed to plan. So what I did was set up a spread sheet listing the characters, their location, their specific roles and their connection to each other. I also kept detailed notes on the information required to tie characters and events together, and placed ‘markers’ through the manuscript to indicate where extra pieces needed to be written. I needed these markers because I found I was writing parts of the book that weren’t necessarily in chronological order. It didn’t help that the book also skips through time, so I had to be very careful about where I placed which occurrence. Taking the time to chart what I was writing kept me on track. At first I was worried a spread sheet would endanger the freedom of the storyline. I worried it would become too formulaic—too predictable. But the opposite happened. Extraordinary coincidences began to occur with characters and events and the research I conducted. It was extraordinary. Life circumstances forced a four-year break from The One, and I have only just looked at the manuscript again this past month or two. Without my notes and spread sheets, I would have been lost, so I’m thankful I learned how to structure my own writing process. When it came to writing my Riley the Little Aviator picture books, things went a little differently. I’m a really visual person, so all four books (as well as number five, being written now) were actually done after I had chosen a series of photographs to dot throughout the storyline. I would place these photos directly onto Adobe Illustrator book pages and begin to write the text around the photos, chopping and changing it as the story went along. For all four books, I had absolutely NO idea of the endings. I knew roughly where the story was going and I had faith that the ending would unfold, magically. And indeed—each time, it did. For Riley and the Curious Koala, this writing style was particularly strong. As Kieron illustrated each page, I was spurred on to the next, and would often make changes to the text to reflect Kieron’s (often hilarious) interpretation. The storyline for Curious Koala wasn’t finished until around three weeks before printing. 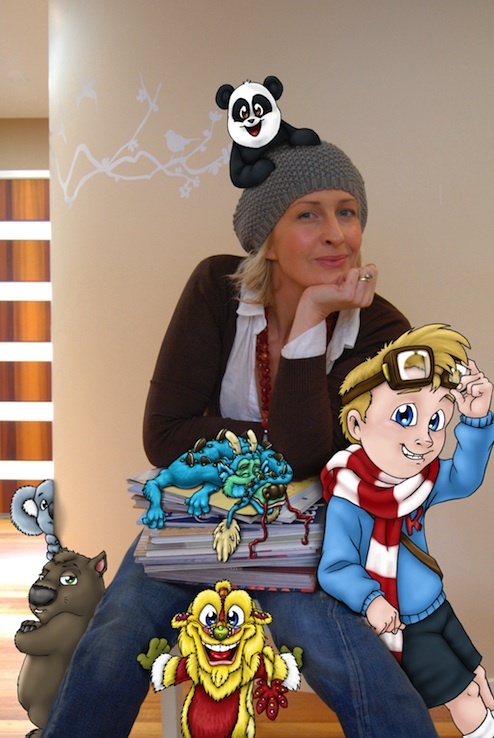 This was a wonderful process—collaboration between author and illustrator. I loved it. For Grumpy Wombat, I had to get the text in shape well beforehand because Paul Collins from Ford Street needed to approve it for publication. The final version, however, was still played around with right up to the last minute, even as pages were being laid out by the graphic designer. I absolutely loved having such freedom and scope to perfect the text so close to printing. For my non-fiction books, my process is more methodical. For my history book for the National Library (Australian Story: An Illustrated Timeline, out 2012), I did a stack of historical research. I kept a Word document and a spread sheet that covered the text, images, references, links and notes. When it came to actually finalising the text, I placed it onto landscape book pages, just like I did with my Riley books, so I could ascertain how much text would be needed and in which timeslots I would need to write more. This helped me with image selection, too. It helped me keep focus. For my lifestyle book—Handmade Living—I kept computer and hard copy versions of the work so I could write, layout and edit with greater ease. This helped me cut down the editing process considerably. Some authors may work their way through books from front cover to back cover, but I find that, no matter the genre, I tend to jump around and write what works at the time. If I’m struggling in one area, I leave it and move onto a part I feel compelled to write in. Whilst I do believe in ‘pushing through’ writer’s block (it works for me), I also believe that if a section of any work is sticking, you may need to work on another section for a while. Sometimes we just need a few hours or even a week to let a certain part of any book simmer. Then things will flow again. The writing process is certainly a unique one and—like anything—the more you practise, the easier it becomes. So long as I have good coffee, silence, a nearby plant or flowers, and lots of sunshine streaming into the room, my writing processes are always joyful. Thanks for visiting and talking to us about the writing process, Tania! 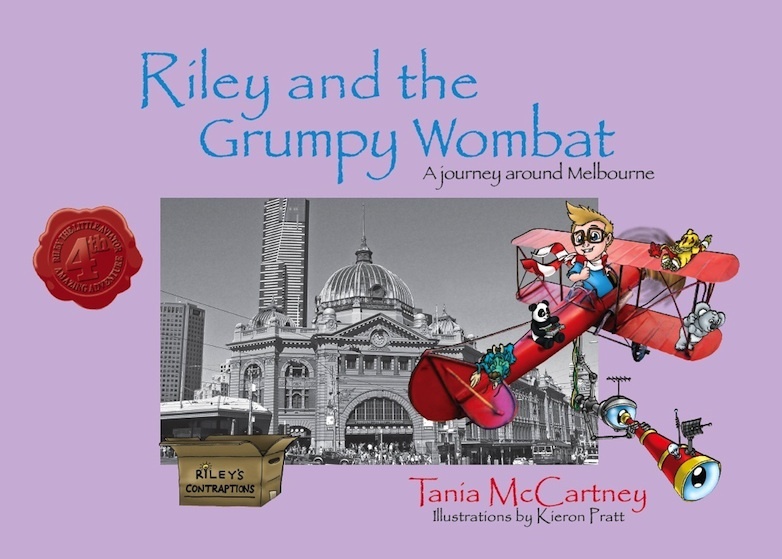 Tania McCartney invites you to The Grumpy Book Launch in September—to celebrate the arrival of Riley and the Grumpy Wombat. Suitable for kids aged 2 to 10. Where: Dalton’s Bookstore, cnr Marcus Clarke & Rudd Streets, Canberra City.